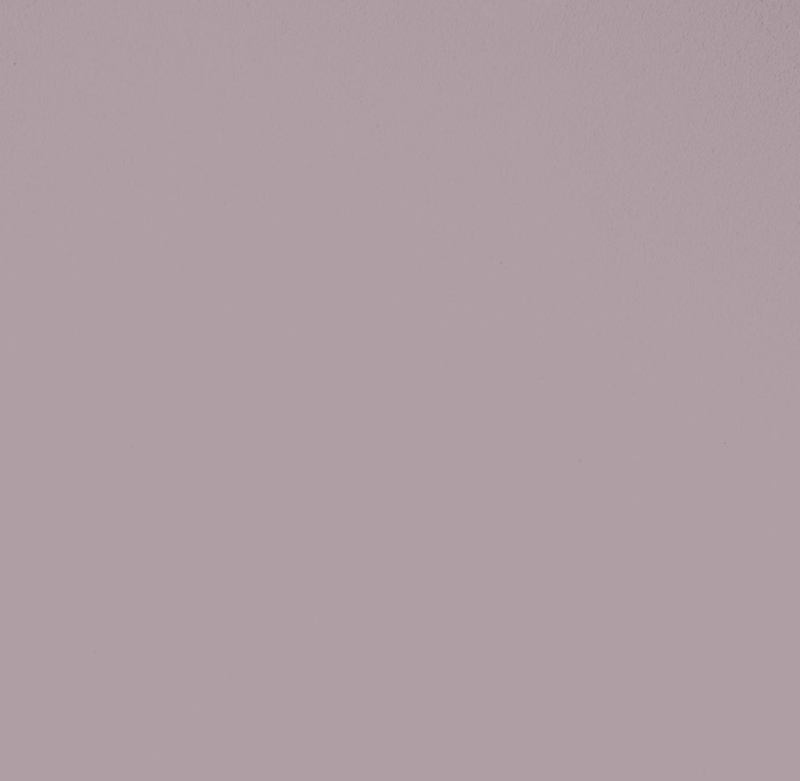 The colours lilac and lavender are often thought of in the same breath, after all, they both originate from flowers, and they both sit within the blue to red spectrum. (We could throw violet in here too, but let’s not over complicate things! In your head, just pop violet in between the others.) However, I’d like to suggest that these two hues have nothing in common, and in fact rarely even sit comfortably together, unless in a vase. Lavender and Lilac. Photograph by Michelle Ogundehin. Flowers from The Real Flower Company. Where to begin… the simplest way to think of it is that lilac is warmer and pinker, because it has more red in it, and lavender is cooler, and bluer. But colour can only really be understood when in context. As such, I see lilac as a loud, full-bodied, big and blousey colour, it wants to be noticed, it craves recognition. Whereas lavender is quieter. Its charms are more subtle. Love for lavender creeps up on you, step by stealthy step. It can be quite modest, sedate, and yet still pack a punch. Lilac, I think you either love, or loathe, right from the start. Funnily enough, when I was thinking about these colours, I was immediately reminded of the film Bridesmaids, bear with me here, it’s the way my mind works, but don’t you think that lilac is kind of like the character played by Melissa McCarthy, whereas Kristen Wig’s mildly repressed Annie is lavender? (Incidentally, I LOVED McCarthy in this film, and she won an Academy award for best supporting actress too, I implore you to revisit the trailer, but I digress…) Lilac needs to fully inhabit any space it occupies, it takes no prisoners and is a solo act, whereas lavender actually improves in collaboration. On it’s own it can be perceived as a little prissy, cold even. But in partnership with palest pinks, sage greens and even crisp navy, it really starts to sing. Both shades have a feminine romanticism to them. An innate grace of sorts, albeit I see lavender as the more mature, and grown-up of the two. Certainly the healing properties of its scent do not need to be re-stated here. 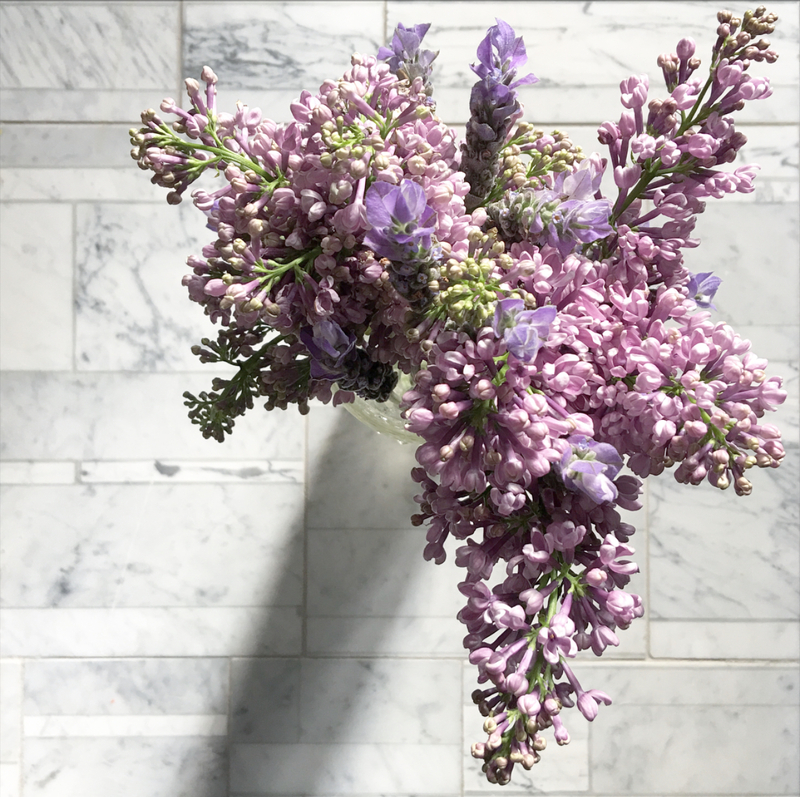 Lilacs are renown for their fragrance too, and are reputed to have similarly soothing qualities, but theirs is a stickier, sweeter more intoxicating smell than the gentle notes of lavender, which is more subtly suggestive of rest and recuperation. Interestingly, lilacs belong to the olive family, lavender to that of mint, which makes sense if you think about it. And, lilacs have one further claim to fame, a place in Greek legend… apparently, Pan, the god of the woodlands, was so infatuated with the beautiful nymph Syringa (lilac’s botanical name) that he chased her through the forest. So alarmed was poor Syringa by his advances, that she changed herself into an aromatic bush, that which we call lilac. Today, I’m not sure how well this myth sits within the context of the #MeToo campaign, but it struck me as ironic that common parlance includes phrases like a ‘lavender marriage’ and yet I’ve never heard anyone speak of ‘a lilac relationship’? Lavender and Lilac. Photograph by Michelle Ogundehin.  Wall colours: Calluna (wall) and Brassica (panels), both by Farrow & Ball. Bowl by Muriel Grateau. Flowers by The Real Flower Company. Napkin by Himla. So how to use either. Generally speaking, colours that could sit within the purple sector of a colour chart — ie those primarily composed of red and blue — supposedly engage the intellect and engender concentration, calm and balance so it’s a colour well suited to living rooms and studies. It’s also said to be a shade favoured by those of a creative disposition, as well as mystics. In terms of association, it’s worn by a widow in mourning in Thailand, denotes virtue and faith in Egypt, and wealth and prosperity in Japan. Additional fun fact, in the US, a state that has an equal number of Democrats and Republicans, is said to be a ‘purple’ state. A complicated spectrum then. In specific terms of how to use it, lavender, I’ve covered in a previous post, so here I’ll concentrate on lilac. And I’ll be brief. Don’t. In my humble opinion, it has no nuance. It lacks depth. I don’t like it. There, I said it. Lavender can be tricky too, but it has sufficient breadth and depth that enables it to be worked to wonders. 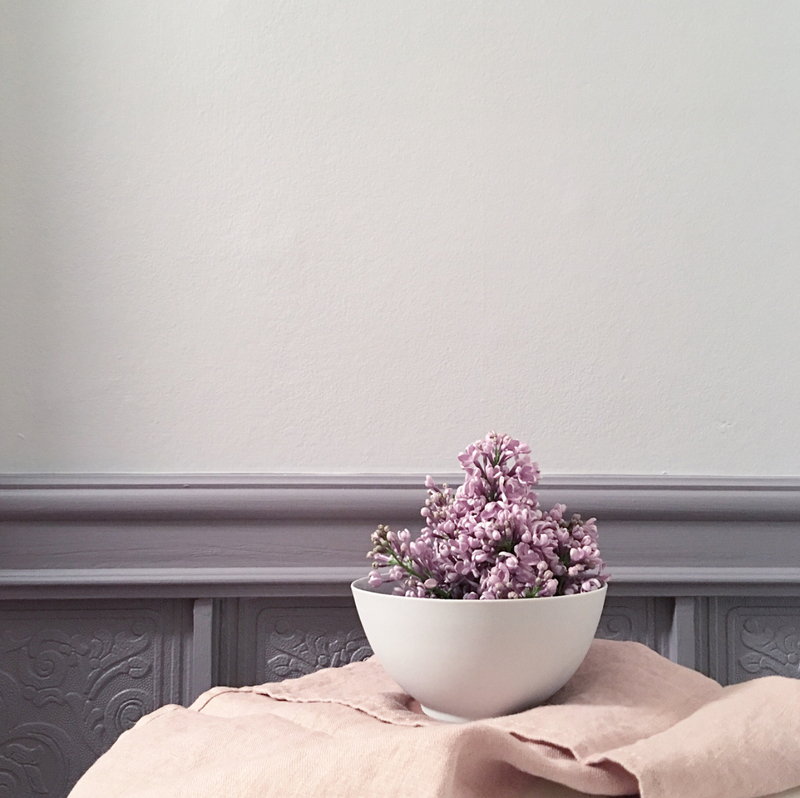 Lilac, to my eye, can’t really be paired with anything other than white, which doesn’t count, and a room entirely in this shade would be unbearable — too sickly sweet. As such, I’d simply stick to introducing it as nature intended, as blooms, big and frothy, jumping out of the bowl to greet you like an over-eager puppy – see above, here, set against lavender, with a little peach thrown in as a palette disruptor, it’s good, holding its own, but not allowed to run riot. My position chimes too with the very nature of the originating plant: lilacs are said to mark the beginning of Spring, and they flower only for a few short weeks; lavender, on the other hand, is a perennial. And, I feel further vindicated in my proclamation of love-lack for lilac after examining many a quality paint chart… all exhibiting, I would suggest, variants of lavender, not lilac… that said, my lounge (location of image above) is painted in two shades: Farrow & Ball’s Brassica, “a dark and sophisticated lavender”, paired with Calluna, described by them as ‘a tranquil lilac’!! Of course I heartily disagree. It’s lavender! Hard to capture, even in my photograph. As always I recommend the trying of umpteen sample pots before you commit to any colour. And sit with a colour sample for a couple of days too… you need to see how it changes with the light, to be sure you love it completely. Shades of lavender, from left: Edward Bulmer Paints, Paint & Paper Library, Fired Earth, Bauwerk Paint. 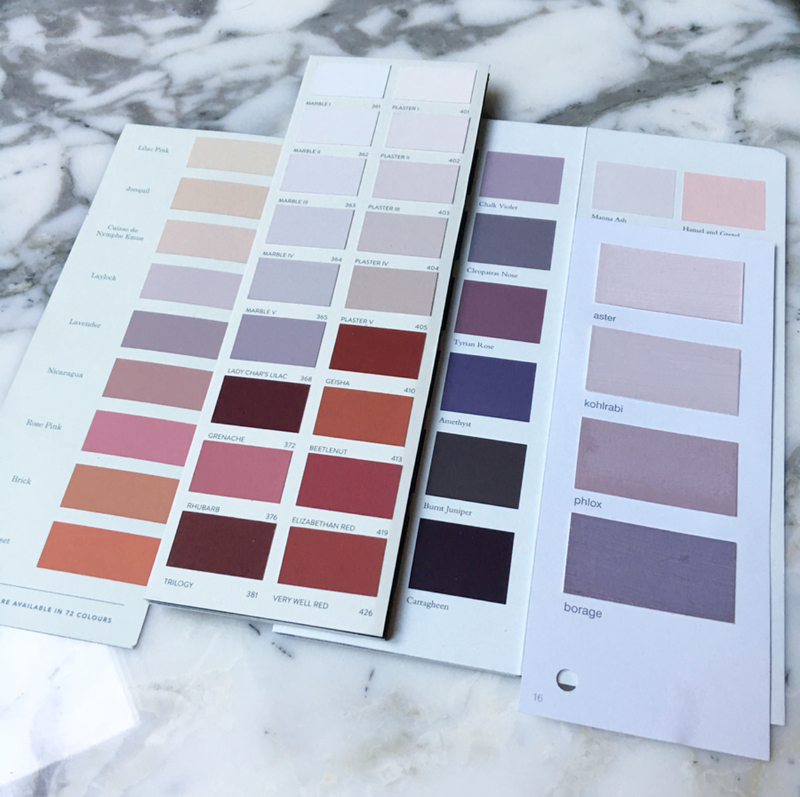 Edward Bulmer Paint… sitting between the peachy tones and blush pinks are Laylock and Lavender. Laylock looking very peachy as shown below? On the actual site its truer bluer tone comes through. Paint & Paper Library… an extensive range of shades from Marble II which is white with a smudge of love, through to Marble V which has a lovely warm tone.  There is a shade below it called Lady Chair’s Lilac, however I’d protest that this should actually be Marble VI, as it’s simply one tone darker than the former. Fired Earth… the names say it all… Chalk Violet, Cleopatra’s Nose, Tyrian Rose and Amethyst. Only the second, in my opinion, is a lavender derivative with just enough blue in it, and Tyrian Rose is perilously close to a lilac, but I maintain it’s deeper and more intense. Almost Burgundy? Might be nice for a front door? ‘Tyrian Rose’ by Fired Earth. Bauwerk… a lovely chart that demonstrates in one, how beautifully lavender (here Borage) sits happily with pale and blush pinks. And it needn’t have much red in it to do so.